In brief: Utterly reliable, the proportions are almost as regular as Subway and the lines move fast. 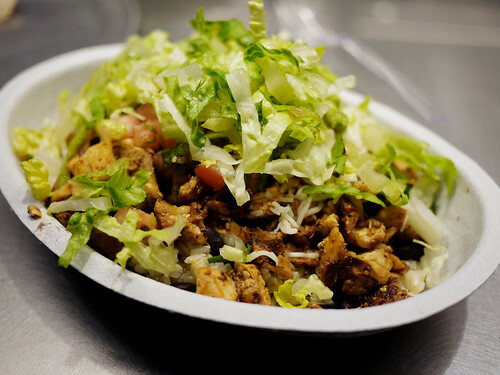 Don't be shocked, but we went to the new Chipotle on Spring today for lunch. The infiltration of a up and coming chain to this particular neighborhood is a bit surprising, especially given the many options for good Mexican food around here. But still we wanted to check it out. Aside from the insane pace of the factory-like ordering line, about as nice a fast experience as can possible. Their signature bowls are filling but not heavy, the spaces are design-y and efficient. The space has had some frequent turnover of restaurants over the past several years, but judging by the hoards of lunchers there today, Chipotle will probably stick around for awhile.